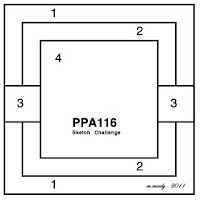 Welcome to Pals Paper Arts Sketch Challenge. Margaret Moody has provided us with another fine sketch. How will you interpret it? Here, I chose to make my card 5" x 5". I snipped the bottom of the Whisper White front off by using the Eyelet Border punch. I put a strip of Nursery Nest paper above it on the front and below it on the inside of the card. I covered the rest of the front with a second print from Nursery Nest. I then wrapped a 1/2" Stitched-Poly Ribbon in Blushing Bride and tide a knot on the right side. On top of the ribbon, I popped up a square in Perfect Plum, which was run through the Big Shot in the Square Lattice Embossing Folder. A third print from Nursery Notes was placed on top of the Perfect Plum and accented with a row of Basic Pearls. Finally, I added my sentiment from the God's Blessings stamp set. I stamped it onto Whisper White using Perfect Plum ink. Before adhering it to my Perfect Plum piece, I matted it with a piece of Blushing Bride card stock. I hope you enjoy looking. Please leave any comments you have below. I love to read each and every one. Through October 31 ONLY, Stampin' Up! is offering a free Big Shot (or $100 in free Stampin' Up! products of your choice) to anyone who buys a Starter Kit! This is in addition to all of the items in your Kit AND 30% off your first order (of $150 or more within 30 days of signup). Contact me if you have any questions. 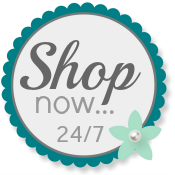 I'd be happy to help you find out how you can get your Starter Kit and try out Stampin' Up! products without further obligation. Additionally, Stampin' Up! is having is Buy 2 Simply Sent card kits and get a FREE coordinating Stamp Set! Orders can be placed at a workshop or online through October 31, 2011. This is adorable, Patti! Love the soft colors and, of course, that amazing layout! I have yet to use this paper - what am I waiting for?? This is so sweet - love the colors, the sentiment and those birdies! Patti this is adorable! Love the look and colors. The bottom trim reminds me of a cozy baby crib made up... and the focal point a picture on the wall. Just me? Love it. Hugs. What a perfect baby card, Patti! I love the texture, and the colors are wonderful! This is simply adorable. Love the mix of DSP & texture. Just love this mix of colors. So cute! Also just love your new font, so clean and easy on the eyes to read. What a sweet baby card, Patti! I love the colors and love how you featured the sentiment on the embossed mat of Perfect Plum! So cute! so very cute!! clean and simple and just adorable! Patti, this is downright pearlicious and precious all wrapped into one! Great job as usual, Patti! Love the sentiment taking up the focal point!